A double major in social work and Spanish, Amy plans to attend graduate school and pursue a career as a counselor or therapist. She plays clarinet in Northwestern's band and orchestra and is spending a semester studying abroad in Spain. 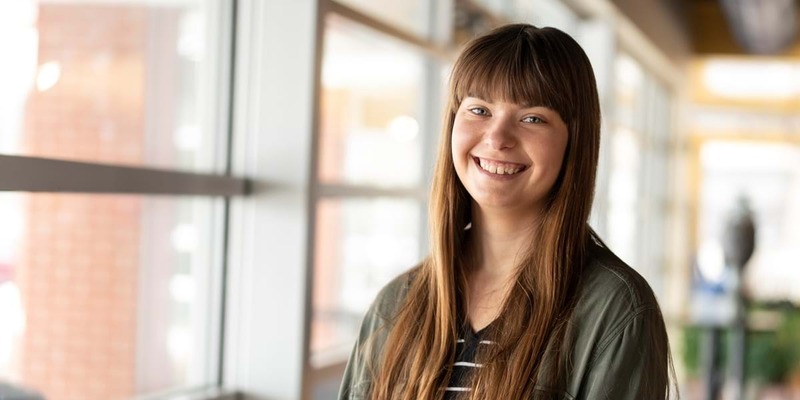 She was also a member of Northwestern's Summer of Service team and spent the summer before her senior year as a short-term missionary in Uruguay. I grew up in Orange City and never (ever) envisioned myself attending Northwestern. I thought I wanted to get away and experience something completely new. Initially, I chose Northwestern because I was offered great financial aid. I keep coming back each year because of the incredible opportunities and experiences I've gained here. Orange City may be small, but there are loads of ways to branch out and try new things! I’m majoring in Spanish in addition to social work, which means my course schedule is pretty packed! Thankfully, my social work and Spanish professors have worked patiently with me to make it possible to manage both majors. Without amazing professors, there is no way I could have fit so many amazing things into four years! Northwestern’s social work program goes far beyond memorizing information and testing factual knowledge. We also discuss the important taboo topics in our world, the significance of self-care, and how to cope with potential tension between our career and our faith. I think one of the most rewarding things we can do is help someone else help themselves. One of my social work professors likes to say, "We’re trying to work ourselves out of a job.” I can’t wait to be in a career where I can open myself up to people in need and help them reach a point where they feel healthy and equipped to face the world without me. Because I hope to do counseling or therapy someday, I plan to continue with graduate school after Northwestern. NW's social work program is accredited by the CSWE (Council on Social Work Education), so I can complete this in one year instead of two! There are many different aspects of social work I can focus on in grad school. I would love to work with art therapy someday, so I’m interested in digging deeper into the integration of art and social work at the graduate level. I have met so many marvelous people at Northwestern. I’ve met professors who challenge me academically and personally, as well as friends who will be dear to me for the rest of my life!